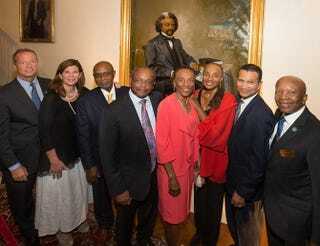 Historic Unveiling of Frederick Douglass Portrait at Governor’s Mansion in Md. When Maryland Gov. Martin O’Malley first moved into the historic Government House in Annapolis, Md., something struck him: There were no portraits of black Americans who had influenced the nation among those of historic greats like George Washington. That was remedied Monday when the governor unveiled a portrait of Frederick Douglass—the first of an African American to hang on the walls of the governor’s residence. And so, with the help of his friend Eddie Brown—the founder, chairman and CEO of Brown Capital Management in Baltimore—and Brown’s wife, Sylvia, O’Malley moved forward with the Douglass project. It was the Browns who commissioned the portrait by celebrated artist Simmie Knox, the first black American to be commissioned for a presidential portrait, who completed the portraits of President Bill Clinton and first lady Hillary Clinton in 2002. “Frederick Douglass famously said, ‘I would unite with anybody to do right and with nobody to do wrong.’ Commissioning this portrait of Douglass, a great American, under the leadership of Governor O'Malley for the Government House was simply the right thing to do, the right choice for me and my family,” Eddie Brown said at the event, according to a press release. The portrait commissioned by the Browns isn’t Knox’s first of Douglass. That description goes to a 1976 portrait that is part of the Smithsonian Institution’s art collection and is currently being housed in the Center for African American History and Culture at Anacostia in Washington, D.C.
“I have painted Frederick Douglass before, but this portrait is special because of the historic representation it holds in the Maryland Archive collection and because of Governor O'Malley's admiration for Frederick Douglass. I am honored to have been chosen to paint it,” Knox added, according to a press release. The decision to have Douglass’ portrait made comes from a place of deep admiration on the part of both Brown and O’Malley. The admiration never ceased, even when O’Malley became the mayor of Baltimore. When he was elected, he chose to spotlight Douglass’ brutally honest and poignant autobiography, Narrative of the Life of Frederick Douglass, an American Slave, in the city. “When I was mayor of Baltimore, when I was first elected mayor, we made [Douglass’ narrative] the book of the year, requesting that everyone read it, even handing it out at middle schools. Does the governor, who is in his final year, given term limits, foresee any other great African Americans joining Douglass on the walls of the residence?